I assume by now you would have known how to let Blogger include your signature image automatically in your post. Just to cover all grounds, I'm gonna include this step as well in this tutorial. First, create a new post, and upload your signature image to that post. You don't have to publish the post, we just wanna obtain the image's internet address. Once you've uploaded the image, click on 'Edit HTML', and copy the HTML code that you see in there. 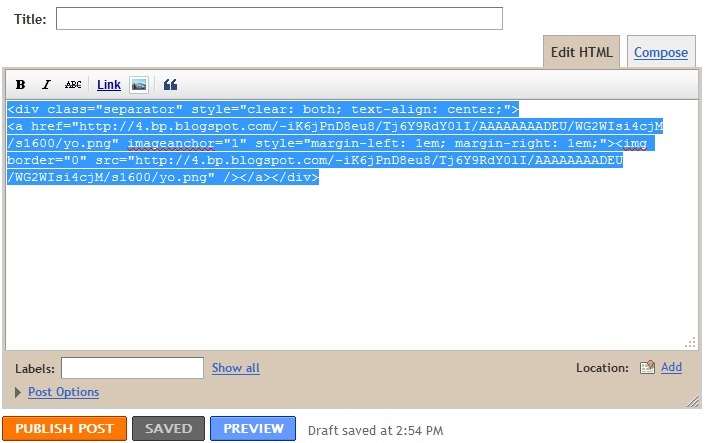 In the default layout: Go to Dashboard - Settings - Formatting - Post Template - Paste the HTML code there. In the new layout: Go to Dashboard - Settings - Post and Comments - Post Template - Add - Paste the HTML code there. In the code that you've just pasted, you will see the tag 'class="separator"'. You need to add another tag next to it --> id="ssnoshadow"
Click on 'Save Settings' when you're done. Now, go to your Template Designer and add the following CSS code. In the default layout: Go to Dashboard - Design - Template Designer - Advanced - Add CSS - paste the following code - Press enter after the last character of the last line } - Apply to Blog. In the new layout: Go to Dashboard ('House' symbol) - Template - Customize - Advanced - Add CSS - paste the following code - Press enter after the last character of the last line } - Apply to Blog. That's all folks. Enjoy your borderless and shadowless signature image. Awesome, thanks a lot again! @MeliBusla: No problem. Cheers and God bless. There are two of us that post at my blog now, so two sig files. Is there a way to do this? Should I include both sig file urls in the beginning step and then when either of us posts, we just delete the other's image from the HTML editor? I followed all the steps then thought I'd go back and try to copy the code from the formatting to retroactively get rid of the shading around the boxes in our "About Us" page (not in the blog post form, just on a regular page) and the code was shortened and it didn't work. Any suggestions would be seriously, wondefully appreciated. I've used so many of your little tips on my site it's insane. @Barbara: That's right. Include both signature images' codes in your post templates, and manually delete one of them each time before you compose/publish your post. Do the same for the other picture. Cheers and God bless. Not surprisingly at all, that worked perfectly! Thank you so much, you're the best. @Barbara: No problem at all. Cheers and God bless. how do you do this for a single photo for one post and not for the photos for the entire blog? @shishi the great: That's easier. Skip Step 1 and 2. Just upload an image to your post editor, then click on 'Edit HTML'. Then perform Step 3 and Step 4. @Andee: Yay again :) Cheers. Sir how can i just the border or width of my post?? i am using customize template by other person... I cant edit the width in template designer in layout it tells "Not applicable for this template" what should i do to fix it? Thank you so much! Fantastic tutorial! I have tried this, and my signature is not showing up at the end of the posts. Is there something I'm missing? I'm so grateful for this little fix. Thanks a lot! This is SO helpful, found out so many useful tricks on your site! I've got it bookmarked! Hello, I tried using this tutorial, I had it working (I was so happy! ), but went to change my signature, and now I following the same steps, I cannot get it to work! The part that won't work is the css. I upload my image just fine, but the border and white box are still on my signature after copying and pasting the css part. HELP! Totally years after your original post, but it's still coming in handy. Thank youuuu! This made my header image disappear. Any idea what happened? Odd. 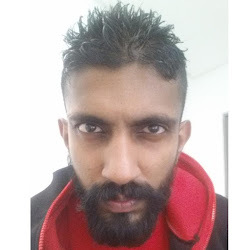 Mind if I have a look at your blog? Awesome, you are great! Thank you!!! Ah, this still isnt working for me! I have my signature uploaded onto Photobucket as a hosting site but can't get it on my blog, let alone without a shadow box. Can you help? Sorry if this is a duplicate comment - I still can't get my signature to work, it still has the white box! Going crazy - can you help? Looks like your signature is appearing fine now. Have you got this sorted? Sorry for the late reply btw. Hi Yoga! Same here. It worked previously but now I can't get that white box gone. Can you help? I know this post is way old. Have you gotten this sorted? I don't see any white boxes any more.. Yes I did! 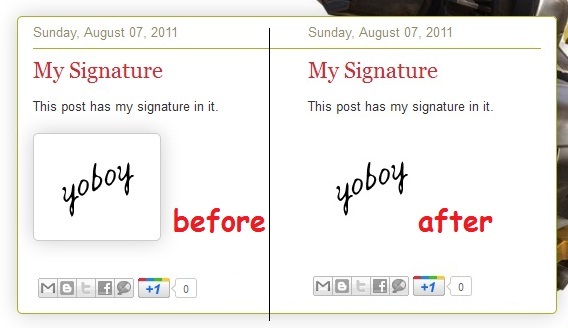 I had to use the instructions on your other post for removing the box and shadow from all blog pics and not just the sig. Worked then. Thanks for the reply. Have you got this sorted? I dont see any borders around your signature anymore. Finally! This has been making me crazy. Thank you very much!! !